On Monday, the 28th of September 2015, the next total eclipse of the Moon will furnish, starting at 2h11 in the morning, if the meteorological conditions are right, a spectacular astronomical show. It will take place when the Moon, copper coloured and as close to the Earth as it will ever be, will have an impressive apparent diameter. Lunar eclipses happen at full moon, when the Sun, the Earth and the Moon are perfectly aligned: the Moon is then completely immersed in the terrestrial shadow created by the Sun. On Monday, September 28th, this phenomenon will be particularly spectacular, since it will happen when the Moon is at perigee, i.e. at its closest distance from the Earth, roughly 357 000 km, instead of the average distance of 380 000 km. The apparent diameter of the Moon will thus be rather large: 33,48’. 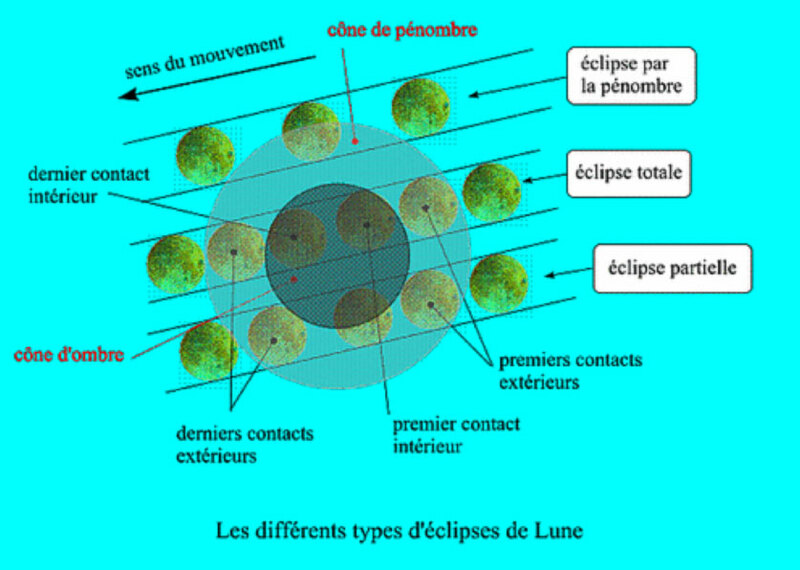 The last total eclipse of the Moon visible in France was in 2008. The lunar orbit around the Earth is not a perfect circle, but an ellipse. Consequently, the Moon is not always at the same distance from the Earth. On that day, the Moon will be in the constelllation of Pisces, towards the south-west and will be relatively high in the metropolitan sky (about 28°). Visible right through the night, full Moon will occur at 04h 50m 30s. End of totality: 5h 23min 4s (Totality: 1h 11m 55s). The Moon enters gradually the penumbra, and then the shadow of the Earth. The copper coloured aspect of the Moon is due to the fact that the red rays of the Sun are slightly dispered and deviated by the lower layers of the terrestrial atmosphere towards the centre of the shadow cone of the Earth. The strength of the colour bears witness to the transparency of the terrestrial atmosphere; if there is a great deal of dust, the Moon will be very dark, even invisible. The more transparent the atmosphere, the more the colour of the eclipsed Moon will be coppery red or orange, with bluish edges. Conversely, the darker and greyer the Moon, with hardly any discernable details, the more the atmosphere is full of dust particles. Thus, the general aspect of the Moon during the total eclipse furnishes a snapshot of the overall state of the terrestrial atmosphere! This total eclipse of the Moon is the fourth and last eclipse of a series of four consecutive total lunar eclipses which occurred in 2014 and 2015; the series of four total lunar eclipses is a relatively rare phenomenon, given that a succession of five total lunar eclipses does not exist. «It will have happened only 177 times during the 6000 years spanning the period 3 000 BC to 3000 AD It will happen again in 2032 and 2033 », added Pascal Descamps, Paris Obsservatory astronomer at the IMCCE.